How can you go wrong with coach? This is a rear value. This is a great casual everyday watch. The watch band is a textured rubber-like band. Watch face is a heavy silver, not cheap looking. I'm a little nervous about discoloration on a white band over time, but we shall see. 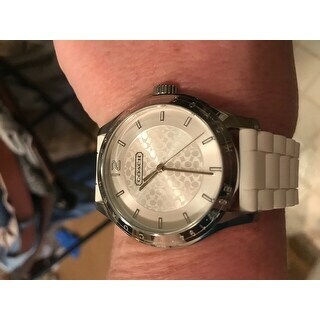 I highly recommend this watch especially for the price. Please note with the size of the watch it easily could be a men's or women's. Love this watch. Perfect fit. Great face size. Perfect for work. Keeps great time and is durable. Perfect for a nurse. Very easy to put on and take off. It's light weight makes it comfortable for long shifts. One can NEVER go wrong when it says "COACH"
Exactly how it appears in photo. Very comfortable and classy. 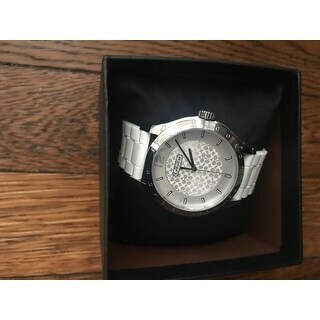 I am in complete love with this sporty watch with the silver face with the coach logo in the background. It’s super great. I also love the rubber white watch band. This is a deal and I would completely recommend getting it to everyone I know. Do it!!! You’ll love it!!! My daughter is a nurse who loves coach. She needed a watch with a second hand. This is an Xmas gift and I really hopes she lives! This is a gorgeous watch and I chose the whit band so she may wear it regardless of where she is. I Like the watch but it is quite heavy, the face is very large. I like the overall look of it, its just what I wanted with the silicone strap. 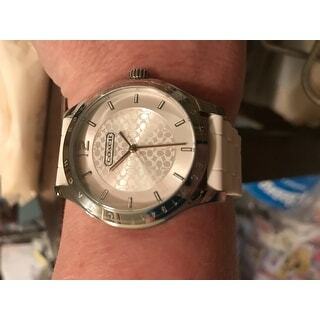 Good quality however this is not a watch you wear every day. The face is a little large and the band is a uncomfortable. The white band is also very hard to keep clean. Lesson learned. 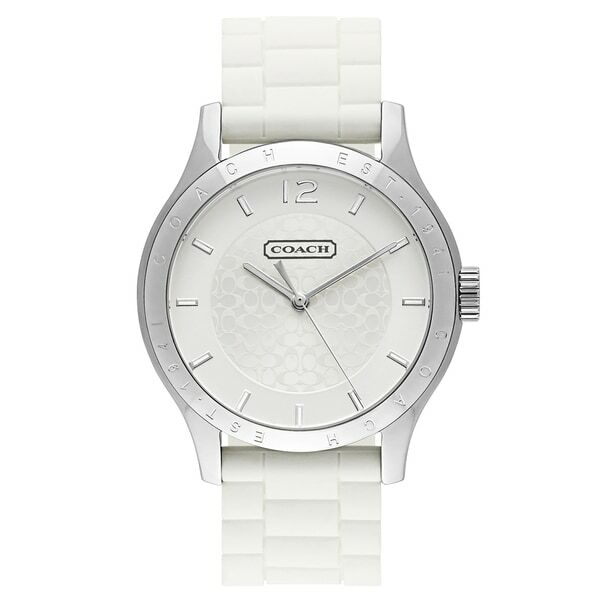 Cute watch, can’t wait to wear spring and summer. Great for s causal look. Purchased for my teen daughter but the face is too big. But I’m keeping for myself. Worth the price. My mother inlaw loves her watch. This was an good gift to give. This watch looks even better close up. It's lightweight and stylish. The white band allows for wearing with any casual, business or sports outfit. Beautiful watch at an inexpensive price for the branded label. Wish I could keep it. I purchased this watch for a granddaughter for Christmas. The face on the watch is quite nice although I wasn’t thrilled with the band. It is a flimsy plastic like material. Not sure I would recommend it. My wife is so in love with her new watch. The style and quality is amazing. The quality of this watch is second to none. "can the band be changed to leather? assume by a jeweler"
"Is this watch band adjustable?"